The Idaho Department of Lands (IDL) requires a Term Easement for access across state lands. Developers seeking to site transmission lines across state lands must obtain a Term Easement. Term Easements are regulated under Idaho Code 58-603 and IDAPA 20.03.08. The developer must first contact the appropriate Idaho Department of Lands Supervisory Area Office (IDL) prior to submitting an easement application. The IDL will determine if the requested easement will be allowed based on the need, location and amount of state land that will be encumbered and the costs involved. See Easement Application Instructions Page 1. If the IDL determines that the easement will be allowed, the developer must complete an Easement Application and submit it, with attachments and fees, to the IDL.. IDAPA 20.03.08.046.01. $100 non-refundable easement application fee (Endowment Land Only - Not Submerged Land) IDAPA 20.03.08.046.01. For easements across endowment land, the minimum consideration is $500. For easements across submerged lands, the cost is a one-time administrative fee of $300. The IDL will review the easement application materials for completeness. If the IDL determines the easement application package is incomplete, it will send the easement application package back to the developer. 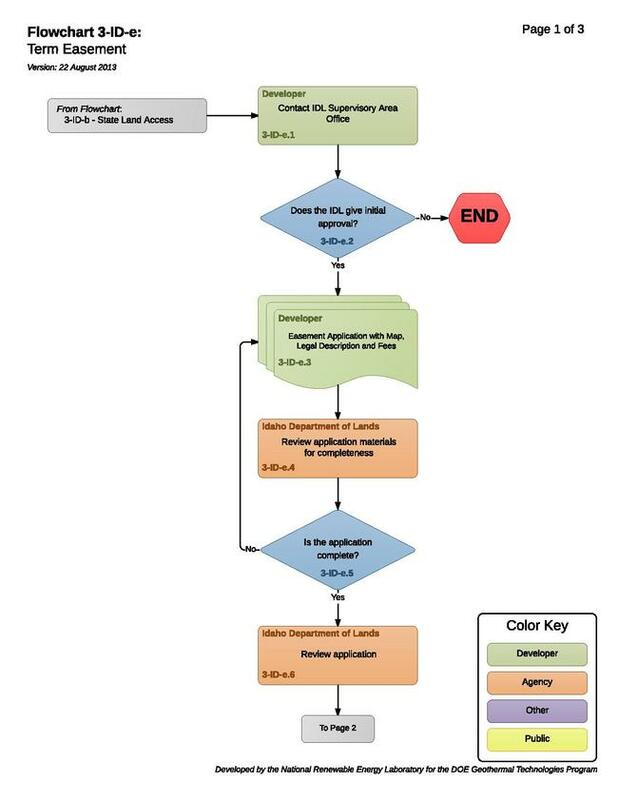 See Easement Application Instructions Page 1. . The IDL will process the easement application package once it is complete. The IDL review of the completed application package will take a minimum of 120 days. See Easement Application Instructions Page 1. 3-ID-e.7 to 3-ID-e.9 – Does the IDL Approve the Easement Application? If the IDL approves the developer’s easement application it will contact the developer to collect any amounts due and issue the easement. If the IDL denies the easement application it will notify the developer of its decision in writing. IDAPA 20.03.08.046. 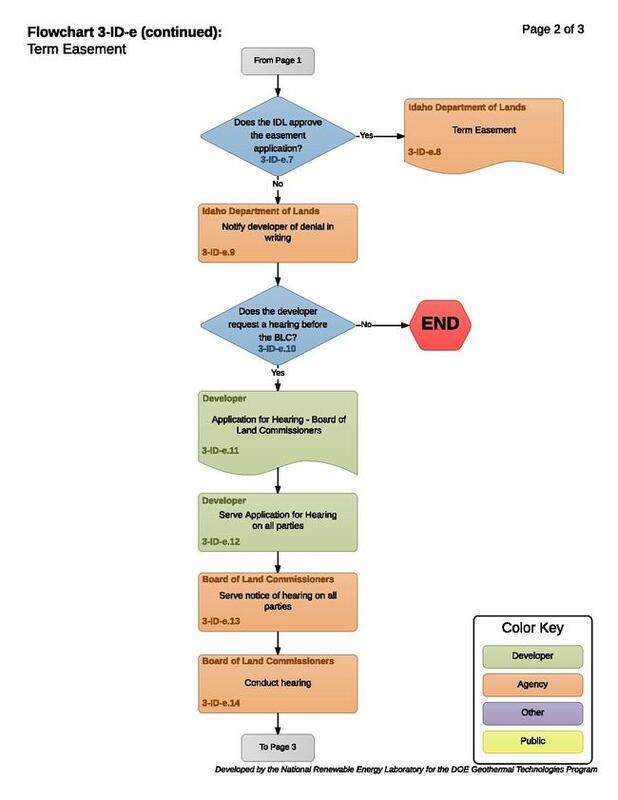 3-ID-e.10 to 3-ID-e.12 – Does the Developer Request a Hearing before the BLC? The developer must serve its application for hearing on the IDL and all other parties to the matter. IDAPA 20.01.01.203. A short and plain statement of the matters asserted or the issues involved. IC 67-5242(1). The hearing will be presided over by one or more members of the BLC, or one or more hearing officers appointed by the BLC (hereinafter the “presiding officer”). IC 67-5242(c)(2). All parties will be permitted to introduce evidence and produce and cross-examine witnesses. The presiding officer is not bound by the Idaho Rules of Evidence. IDAPA 20.01.01.558 and IDAPA 20.01.01.600. If the BLC rules in favor of the developer, the IDL must grant the easement. 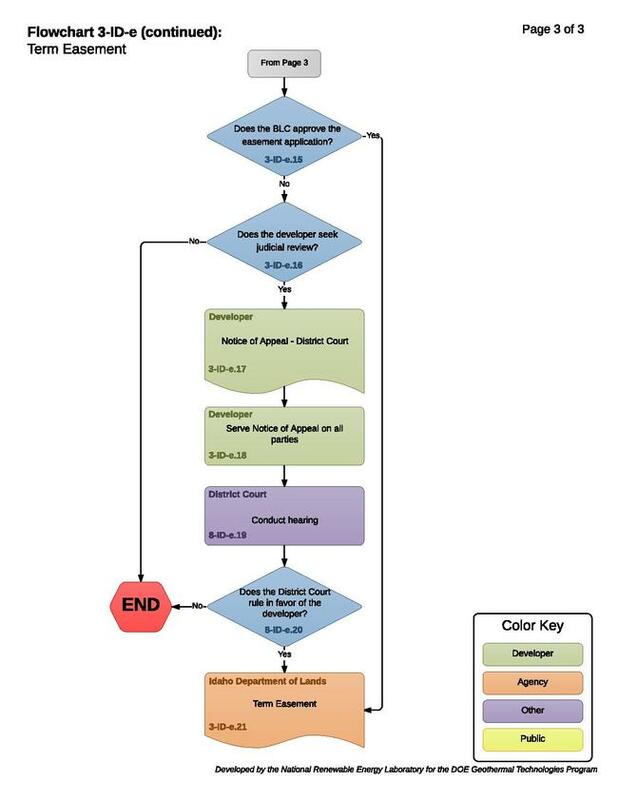 8-ID-a.16 to 8-ID-a.18 – Does the Developer Seek Judicial Review? The real property or personal property that was the subject of the agency decision is located. IC 67-5272(1). The developer must file the petition for judicial review within 28 days of the agency action. IC 67-5273(3). In addition, the developer must serve notice of the hearing upon all persons named in the petition as adverse parties at least 20 days before the hearing. I.R.C.P. 27(a)(2). The District Court hearing will be conducted according to the Idaho Rules of Civil Procedure. If the district court rules for the developer, the IDL will issue the easement. If the district court rules against the developer, the project cannot continue. This page was last modified on 24 September 2015, at 16:09.